Event will begin at 7:00 PM ET on Friday, February 8th, and will run until midnight. Courtesy of Toronto FIR and VAC. 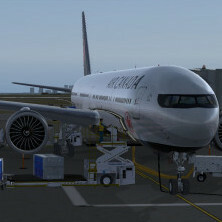 On Saturday, Feburary 23rd, from 2200z-0100z (5pm-8pm EST), Toronto FIR and VAC are partnering to present Flying Night In Canada at Toronto/Lester B. Pearson International (CYYZ). - Flying Night In Canada will be a monthly event happening every third Saturday of the month operating in conjunction with Toronto FIR. 11.7.4 Pilots participating in online events do not have aircraft type rating restrictions when flying onthe VATSIM Network. However the aircraft type must be within current VAC fleet.